The game lasts 5 turns. 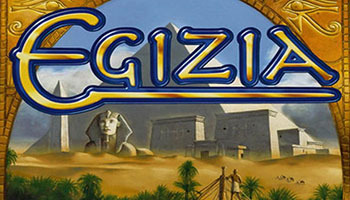 In each turn, the players place their pawns on the board, along the banks of the Nile, getting the advantages shown on each square. On the right bank there are fixed squares where the players may get workers, improve their mercantile capabilities, influence the floods (and thus the fertility of the fields) and reserve the right to build the monuments (that are built only after all the placements are done). On the left bank the players may take cards that are deployed randomly on the 10 squares at the start of each turn; some of these cards are kept until the end of the game (cultivable fields, stone quarries, deities granting special advantages), while others are discarded after the use and offer multiple immediate advantages. 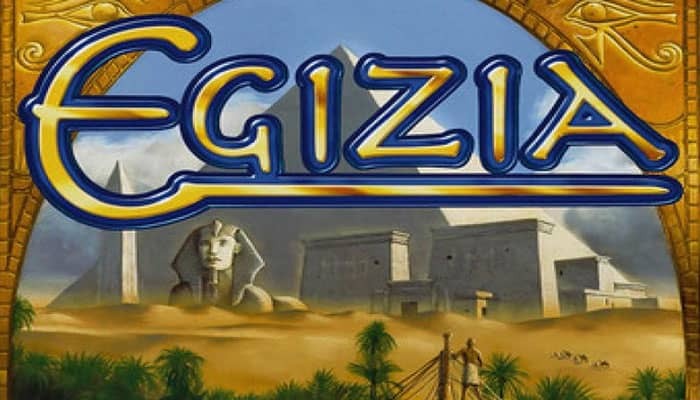 In Egizia, the twist on the worker placement mechanic is that the players must place their pawns following the course of the Nile, moving northwards (from the top to the bottom of the board, that is seen from the Mediterranean Sea). In this way, each placement not only blocks the opponents from choosing the same square (except monuments, where multiple players are always allowed), but also forces the player to place his remaining pawns only on the squares below the one he just occupied (note that "pawns" are placed, since "workers" are one of the resources of the game, like grain and stones). When the placement phase is over, the workers of the players must be fed with the grain produced in the fields. The production of each field is based on the floods of the Nile, so some fields may not give grain each turn. 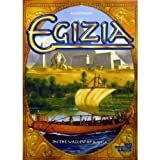 If a player has not enough grain for all his workers, he has to buy it with Victory Points (the ratio is better for players with improved mercantile capabilities, recorded on a specific track on the board). 2. The players use 1 player sequence number tile for each player in the game. They shuffle these tiles secretly and each takes one and places it in his play area. The players collect the sphinx cards face-down and try to fulfill as much as possible before game end. If the 7th, 8th, 9th level of the obelisk is filled in the obelisk, the player receives the points indicated. It is not important whether and how many of the player's own stones are in the obelisk. anytime: The player may use this card at any time on one of his turns. Afterwards, he returns it to the box. permanent: These cards are valid for the entire game and are placed face-up in the player's play area. Grain fields and quarries are also permanent cards. The player who places his ship here must move his marker on both the stone market and the grain market down 1 space. The player who places his ship here must move both shown construction crews 1 space each to the right on his tableau. The player who places his ship here must move his Joker construction crew to the right 1 space on his tableau.